Jacob Dwyer, 10, of Traverse City, looks at a Lego version of the One Detroit Center building Saturday, May 25, 2013 during the kickoff for "Lego Carnival: Building Blocks of America" at the History Center of Traverse City. The Lego event is scheduled to take place through summer. 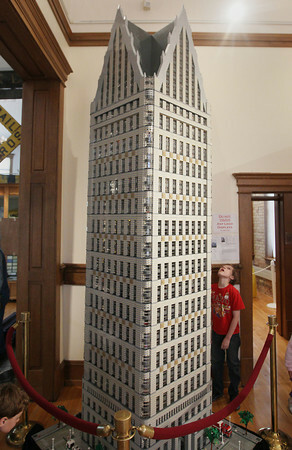 The Lego structure was designed by Scot Thompson, president of the Michigan Lego Users Group.